WANT TO BUY HARDY ORNAMENTAL PLANT SEEDS? THEN CLICK HERE FOR THE 'GARDEN OF EADEN’ SEED SHOP. If I am being completely honest there is no such thing as a black rose. However, there are a few cultivated varieties that have taken advantage of the very dark red pigments that roses can produced. There are a number of different varieties of these so-called black flowering roses - the most popular being 'Black Jade' and 'Black Baccara'. 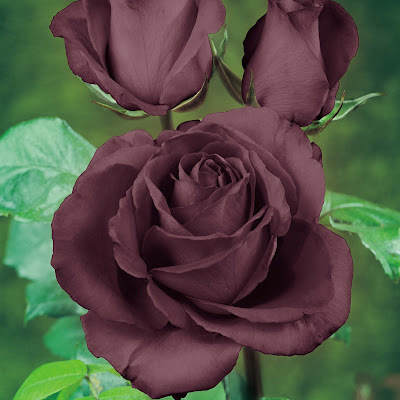 Black roses should be planted in sandy soil so if you feel that your soil is particularly heavy due to clay then you will need to improve the drainage by adding some horticultural grit or well rotted compost to the soil. To preserve the deep colouration, plant out of direct sunlight to prevent the flowers from bleaching - partial shade is preferable. Once planted, water in thoroughly. During hot weather, black roses should be watered at least three times a week - sometimes more for newly planted stock, but avoid waterlogging the soil as this will only result in root damage which in extreme cases can result in the death of your roses. Using a good quality, well-rotted farm manure give your black roses a good thick mulch in the autumn, and once again in the spring. This will help to provide the nutrients needed to maintain healthy growth over the spring and summer.